Left the boat about 12pm and with the help of a Russian used car salesman I'd had several (hundred) vodkas with was waved through customs without any questions. Getting the bike would be different. I couldn't work out who I should really speak to about it and kept getting told different things. Then at 3pm they stopped unloading the boat, I hadn't seen the bike come off, so went back to the hotel. I met the Japanese fella from the boat (I called him Sam!) and through a strange series of events ended up with one of his Russian friends at a lecture about Buddhism being given by a German bloke who was speaking in English. Not a vodka in site. Sam, being Japanese, you might assume he was into Buddhism as many Japanese are, but he actually had no interest. It was only just starting to get weird. Halfway through listening to this English speaking German preaching about an ancient asian religion Sam grabbed me and we left, just in time as my head was about to explode from the perplexities of learning about Buddhism from a German in Russia. 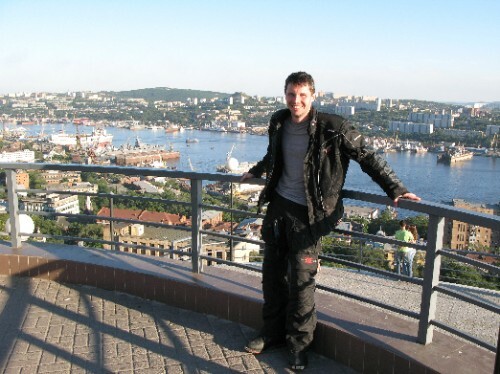 Sam guided me back to my hotel through the Vladivostok darkness, something he rarely went out due to stabbings, muggings and other drunken voilence. Maybe he was a bit paranoid, but he had some advise for me when I mentioned that such things didn't worry me. "This is not your destination Ben-San, you still have a long way to go". Good point sensai! Sharib Yeah, I wish I could meet the ideal schedule! The only time I was able to do that ciseostnntly was when I was unemployed T__T So yeah it's damned if you do, damned if you don't, since I refuse to rush production I have not posted/ censored maybe one or two posts ever, they were posts that had swearing in a non-funny, offensive way. In general though there's an expectation of trust. If I just stopped posting everything that was bad , then I'd be like you know China or some awful place and that's not very nice. You wouldn't be able to trust any of the comments knowing that I could be deleting all the ones that I disliked.